Purity: Greater than 90% as determined by SDS-PAGE. ALT2, AAT2, Alanine aminotransferase 2, Glutamate pyruvate transaminase 2, Glutamic--alanine transaminase 2, Glutamic--pyruvic transaminase 2. General Description of Recombinant Human GPT2. 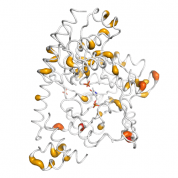 Human GPT2 produced in E. coli is a single polypeptide chain containing 546 amino acids (1-523) and having a molecular mass of 60.3 kDa. GPT2 is fused to a 23 amino acid His-tag at N-terminus & purified by using an optimized multi-step FPLC method for maximum separation from contaminants. Host: QP10654 protein expressed in E. Coli. Protein Construction: A cDNA sequence encoding the sequence of GPT2 was constructred and used to recombinantly synthesize the protein. Application Notes: Please contact us for application specific information for QP10654. Bioactivity Data: Specific activity is > 100units/mg, and is defined as the amount of enzyme that cleaves 1umole of L-Alanine to L-Glutamate per minute at pH 7.5 at 37C. Buffer: The GPT2 solution (0.5 mg/1ml) contains 20mM Tris-HCl buffer (pH 7.5), 30% glycerol, 2mM DTT, 0.2M NaCl. Storage Conditions: Store at 4°C if entire vial will be used within 2-4 weeks. Store, frozen at -20°C for longer periods of time. For long term storage it is recommended to add a carrier protein (0.1% HSA or BSA). Avoid multiple freeze-thaw cycles. Physical Appearance: Sterile Filtered colorless solution. enQuire Bio's products are guaranteed and approved for RESEARCH USE ONLY or manufacturing purposes. This product may not be used as a pharmaceutical agent, or other product intended for human consumption without meeting additional regulatory requirements. This product is guaranteed to work for a period of two years when stored at -70C or colder, and one year when aliquoted and stored at -20C.